Unemployment is on Peak in Uttar Pradesh so much that MSc, BTech, BSc, BEd qualified candidates are interested in Sweeper Post. 107465 applications received are from Degree holders. While the next elections are soon to commence in the State of Uttar Pradesh, unemployment has still not left or altered its position. 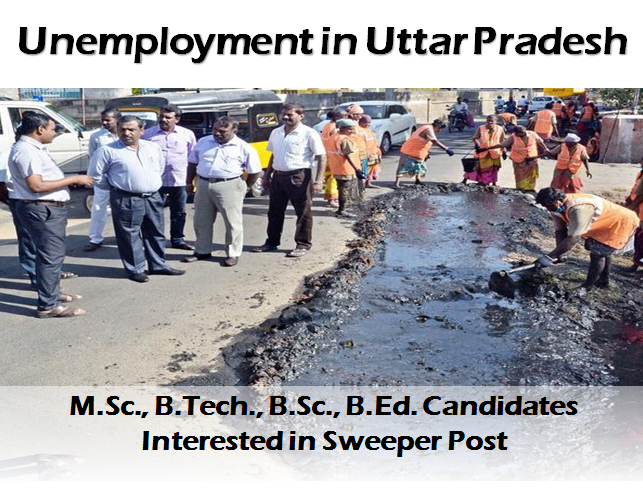 Unemployment is on Peak in Uttar Pradesh so much that MSc, BTech, BSc, BEd qualified candidates are interested in Sweeper Post. Allahabad Nagar Nigam issued a recruitment notice in August 2016 for recruitment of 916 Safai Karmi (Sweeper) Posts wherein, the applications received by the Nagar Nigam are shocking. As per the data, 107465 applications were received out of which per post application was 117 and number of candidates holding degrees who have applied are mentioned below. Candidates who are shortlisted have to go through two steps of selection procedure which includes: Cleaning Drainage and Interview. Alas! All those students who opted for higher education and had some hopes and dreams with their degrees are under a dilemma. The unemployment scenario in UP has shattered the ambitions of youth.